Simon was born in Ste-Foy, Quebec, Canada on February 29 in the year 1980. The first time he put his skates on was at the age of 2 when his parents took him to the outdoor rink for public skating. Not too long after trying out his skates with a help of a chair, he began skating on his own. Hockey was in his blood after all, as his father and also grand father were playing hockey at various levels. Gagne was told to be a “natural skater” since his early age and turned out to be much better than other kids of his age (or even older ones). When Simon was around age 9 he started playing AAA hockey and participating in summer hockey tournaments. Simon was 16 when he broke into the QMJHL as a member of the Beauport Harfangs during the 1996–97 season. Playing mostly on the third and fourth lines, Gagne finished with 31 points (9 goals and 22 assists) in 51 games. The following two seasons, he would play with the Quebec Remparts, totalling 189 points (80 goals and 109 assists) in 114 games, including a 120-point season in 1998–99. That year, he finished sixth in league scoring, was named to the QMJHL Second All-Star Team and was awarded the Paul Dumont Trophy as the “personality of the year”. Simon also recorded 20 goals and 13 assists for 33 points in 25 career playoff matches with the Remparts. After the 1998–99 season, he graduated to the pro ranks, and the Remparts retired Gagne’s #12 jersey during a ceremony early on in the 1999–2000 season. 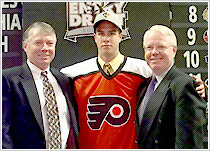 Gagne was drafted 22nd overall by the Philadelphia Flyers in the 1998 NHL Entry Draft and made the Flyers out of training camp prior to the 1999–2000 season. His rookie season saw him play primarily at centre and score 20 goals and 28 assists in 80 games, good enough to be named to the NHL All-Rookie Team. He chipped in 5 goals and 5 assists in 17 games during the playoffs before the Flyers lost in seven games to the New Jersey Devils in the Eastern Conference Finals. The following season, he was converted from centre to wing. 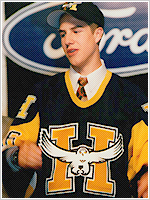 Playing on a line with Mark Recchi and Keith Primeau in the 2000–01 season, Gagne scored 27 goals and 32 assists in 69 games and took part in his first NHL All-Star Game. During the All-Star Game he scored 2 goals including the game winning goal for the North American team. 2001–02 saw him score 33 goals and tally a career high 33 assists in 79 games. A nagging groin injury limited Simon to 46 games and career lows in goals, assists, and points in 2002–03. The next season, Gagne posted 24 goals and 21 assists in 80 games. He also scored a big overtime goal in Game 6 of the Eastern Conference Finals against the Tampa Bay Lightning. However, the Flyers were eliminated in Game 7. Once the 2004–05 NHL lockout came to an end, Simon assumed a greater role on the Flyers and played most of the year as the left winger on the top line with Peter Forsberg and Mike Knuble. The line became known as the “Deuces Wild” line due to their numbers (12 – Gagne, 21 – Forsberg, 22 – Knuble) and Gagne responded with his best season as a pro with 47 goals and 79 points in 72 games. He was awarded the Bobby Clarke Trophy, which is awarded to the Flyers Team MVP. Simon was given a 5-year contract extension in the off-season, worth over $25 million. Despite not having Forsberg as his centre for much of the 2006–07 season due to injury and Forsberg’s eventual trade to the Nashville Predators, Gagne scored 41 goals and 27 assists in 76 games and won his second consecutive Bobby Clarke Trophy. He also played in his second NHL All-Star Game. In the 2007–08 season, Simon recorded 18 points in 25 games before being shut down for the year on February 20 after being told to sit out by doctors. Although it was believed Gagne had suffered three concussions in five months, he was told by doctors that he only had one and further injuries re-aggravated the symptoms. He suffered the initial concussion on October 25, 2007, when he was hit in the jaw with a check from Florida Panthers defenceman Jay Bouwmeester. Simon sat out four games and returned only to be hurt again on November 7. After missing the next 26 games, he was re-injured on his first shift back on February 10, 2008 against the Pittsburgh Penguins. Gagne had a strong return in the 2008–09 season, scoring 34 goals, 74 points, and posting a +21 in 79 games. However, injury troubles persisted in 2009–10. Less than a month into the season, Simon was placed on the injured reserve after being diagnosed with a double hernia in his groin in late-October 2009. Gagne returned to action on December 19, against the New York Rangers after missing 24 games. He scored his third career hat trick and first career natural hat trick just 11 days after returning from injury against the Rangers, December 30, 2009. He finished the season with 40 points in 58 games. After defeating the second-seeded New Jersey Devils in the opening round of the 2010 playoffs, in which Gagne was injured (broken toe after blocking a shot), the Flyers met the Boston Bruins in the second round. After going down 3–0 in the series without Simon Gagne, the alternate captain returned for Game 4. He scored the game-winning goal in overtime, and chipped in two goals in Game 5. After the Flyers became just the sixth team to force a game seven after being down 3-0, Simon scored the series-winning goal in the third period of Game 7 to advance to the Eastern Conference Finals. The Flyers became the third team in NHL history to come back from a 3–0 deficit in a series and win. Despite his spectacular 2010 playoff performance, the Flyers FO got themselves in a situation which resulted in a need of dumping a big salary. After asking Simon twice to waive his NTC he eventually obliged, under the condition of limiting the choice of teams he would accept a trade to. Among those teams were also the Tampa Bay Lightning which he was eventually traded to for Matt Walker and a 2011 4th round pick on July 19 2010. After starting off slow with the Lightning, due to a neck injury and also struggle with the transition from Philadelphia, he began to pick up his game. He finished the regular season with 40 points (17 goals and 23 assists) in 63 games. He was a usual force in the playoffs, helping his team to turn around the series against the Pittsburgh Penguins in the first round. After being injured in the Game 1 of the 2nd round against the Washington Capitals (which the Lightning won 4-0), he returned to the lineup for the Eastern Conference Finals against the Boston Bruins. Unfortunately, the Lighting were eliminated in 7 games. Simon collected 12 points (5 goals and 7 assists) in 15 playoff games. After not coming to an agreement with the Tampa Bay Lightning (though there was a level of interest from both sides), Simon became an unsrestricted free agent on July 1 and right on July 2 he agreed on a deal with the Los Angeles Kings. He signed a two-year contract worth $7 million. His first goal in the Kings uniform came on October 13, 2011 against Martin Brodeur of the New Jersey Devils. Simon debuted internationally with Team Canada at the 1997 Under-18 Three Nations Cup in the Czech Republic where he won his first gold medal. He also played at the 1999 World Junior Championships in Manitoba. Playing as the host country, Canada made it to the gold medal game against Russia, but lost in overtime to earn the silver medal. Gagne scored seven goals and an assist in seven games to finish second in team scoring behind Daniel Tkaczuk’s 10 points. Three years later, Simon made his senior debut with Team Canada at the 2002 Winter Olympics in Salt Lake City, scoring four points in six games to help Canada to their first Olympic ice hockey gold medal in 50 years over the host country United States. Prior to the 2004–05 NHL lockout, Gagne competed in the 2004 World Cup, where he captured his second consecutive international championship with Team Canada, contributing two points in six games. Due to the Philadelphia Flyers’ consistent playoff runs in the NHL, Simon did not appear in a World Championships until 2005, with the NHL lockout still in effect. He finished the tournament with an international career-high 10 points in nine games, third in team scoring behind Rick Nash and Joe Thornton as the three Canadians finished 1-2-3 in tournament scoring. However, as Canada made it to the gold medal game, they were shutout by the Czech Republic 3–0. The following year, Gagne was named to his second national Olympic team to compete at the 2006 Winter Olympics in Turin. Attempting to defend their gold medal from 2002, Canada was, however, defeated in the quarterfinals by Russia and finished in seventh place. Gagne tallied three points in five games. Named to the 2009 summer camp roster for the 2010 Winter Olympics in Vancouver, Simon injured his groin and was forced to leave camp on August 25, 2009.